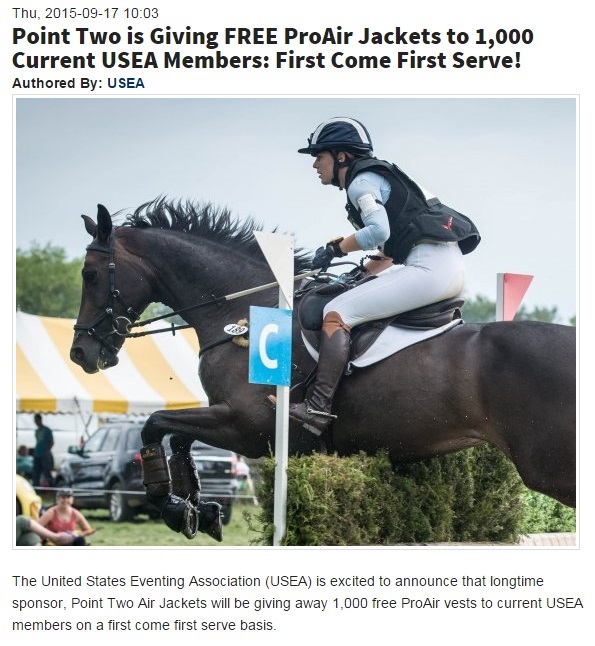 I’m sure I’m not the only one whose eyebrows shot up into their hairline yesterday when they read the post from USEA saying that Point Two was giving away 1,000 free air vests to members. I’m also sure I’m not the only one who immediately went “What’s the catch?”. ProAir Jackets are valued at $675 and Point Two is offering these vests at gratis to the first 1,000 current USEA members that claim them. Members must commit to a 5 year servicing package ($75/year), with annual service including: a cleaning of the outer shell, servicing and replacing piston, springs and lanyards if needed, a brand new air bag, and a lifetime warranty. Members must also purchase one CO2 canister at the time of the annual service. Ah, well, that makes a lot more sense doesn’t it. $375 up front (keep in mind they were selling demos for that much last year, so you know they’re making money at that price) means that they are assuring they see a profit regardless of whether or not you ever send it back for service, plus $47 a year on top of it. Because yeah, their normal annual service rate is $75, but it includes shipping and doesn’t require the purchase of a canister. Those terms make me think the number crunchers at Point Two did a great deal of thinking on this to figure out how to still come out profitable in the end. I’m not saying this isn’t a good deal. If you really want a vest, were planning on buying this particular brand anyway (at which point I would urge you to compare/contrast), and you would actually be among the 2% of people that sends it in for service every year, you’re gonna come out ahead. But otherwise, make no mistake, this is a payment plan. $375 up front plus $47 a year (plus whatever shipping costs for you to get the vest to Point Two, probably $10ish) for 5 years is a $660ish commitment. Let’s call a spade a spade – this isn’t a giveaway, it’s a sale in fancy wrapping. Point Two has done a very smart thing here; they’ve invented a way to “give away” product, still make money at it, and boost their repair/service rate. How’s that for a business rejuvenation plan? Anyone care to guess how many people will ever send those vests back in for service? Enjoy your $375 vests, y’all. 😉 Hey, maybe Point Two will use the profits to fund some research (specifically regarding: if the sudden and violent inflation – particularly the inward direction of the Point Two – exacerbates injuries that have already occurred, the risk of destabilizing neck and spinal injuries as the vest deflates, the failure rate of detachment, the failure rate of inflation, etc). Then again they’ve said in the past that they don’t have any interest in doing research, so I won’t hold my breath. One really good thing that I do see coming out of this is greater public awareness of the fact that air vests need regular servicing. Point Two’s website recommends annually, after six deployments, or after a hard fall. While it’s true that the mechanisms inside are designed to last longer than a year, dirt and/or water in particular can cause them to massively fail, particularly at/near the canister and lanyard. Of the people I know that own air vests, almost NONE of them get the vest serviced regularly. If you’re going to attach yourself to your horse, at least make sure that your chances of coming properly UN-attached are as great as possible! Interesting plan they have there. I’ve only worn my vest a handful of times but it’s good to know about the recommended service. That really skeezes me out that they have no interest in doing research. Also yeah, I had no idea that they needed annual servicing (though it makes sense now that I think about it). It also skeezes me out that any time an upper level rider has a fall while wearing one of their vests and doesn’t actually DIE, they chime in and claim responsibility. Or when they said that Jordan McDonald wouldn’t have died if he’d had on an air vest (in his particular type of fall – rotational – the air vest likely would not have been triggered before impact anyway). There’s a lot that bothers me, obviously LOL. Wow…Thanks for finding the small print. I saw the promotion for it and thought it was supposed to be a thank you gift to USEA members. I need to open my eyes to see the marketing schemes! The Hit Air actually expands outwards, according to their website “Also, when the Hit-Air vest is deployed, it expands outwards rather than into the body, so there is no pressure expanded onto the body protector, so breathing difficulties will occur.” The Point Two expands inwards, toward the body. Free isn’t really free. Wow. I have mixed feelings on air vests. I think they are definitely lacking research on safety for sure. Actually, in say, Hit-Airs case, there is a bunch of research backed for many years in terms of motorcycle accidents. It is only recently that they have translated over to equestrian sports, but they are very well proven in motorcycle usage – something I consider far more dangerous than horseback riding. Motorcycle racing has significantly different circumstances involved in their accidents though. While I do appreciate that Hit Air has actually done some research (and prefer them over Point Two) the types of falls are much too different to draw conclusions about riding from data gathered about motorcycles. In a study published in the American Journal of Surgery, a team of trauma surgeons and an occupational therapist from the University of Calgary/Calgary Health Region recommends that everyone who rides horses should wear helmets and vests to prevent major, life-altering injuries. The clinical research team reviewed the charts of 7941 trauma patients treated at Foothills Medical Centre in Calgary between 1995 – 2005. Hospital admission rate associated with equestrian activity is .49/1000 hours of riding. The rate when motorcycle riding is merely .14/1000 hours. I applaud the creative marketing gimmick, I really do. And I’m glad that when you did your homework and inquired further you got an honest and straightforward response. But I think you are correct in suggesting that people do some compare/contrast researching before they purchase this one, based on the various things I have read. I saw that and sent the link to my husband, who got really excited and told me to email them. And then they wanted the money up front (well duh) and hey, I don’t have that, so no air vest for me. Back to a Harry Hall or an Airowear overseas! Good job sleuthing it out. I can’t stand it when there is “fine print” with things. It’s so misleading…. Once I read the post and saw the “service plan,” I went… oh, now I get it… *rolls eyes*. Although, to be fair, I didn’t even know air vests needed servicing. I’ve never looked closely in getting one but good to know!